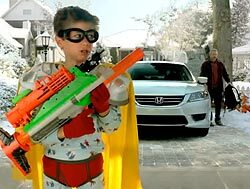 Honda is joining the year-end sales mix with “Happy Honda Days.” The effort, which has an oddly ’60's color-TV feel, features the odd parent or two, with an obstreperous mother saying the wrong things to her son at the wrong time, among other wackos. Each ad has someone thanking Honda for a great deal. The effort, ending Jan. 2, features six TV spots that feature the Honda product line plus rearview camera, Pandora Internet radio and Bluetooth HandsFreeLink. Sarah May Bates, RPA's assistant creative director on the account, concedes that this isn't exactly buying season, though it's critical for automakers for a couple of reasons: it pulls sales out of the hat to make year-end volume. Spots will air on appointment shows like “Modern Family,” “The Good Wife,” “How I Met Your Mother,” “The Office,” “X-Factor,” and on ESPN, TNT and TLC. The company says creative will also be integrated on display ads running on car-shopping sites and network radio. There are also two Spanish-language TV commercials (the company has used La Agencia de Orci' & Asociados for years to handle Hispanic market efforts.) Print will run in magazines like Entertainment Weekly, People, Sports Illustrated, Time, Us Weekly, USA Today and Wall Street Journal. The company says there will also be Tier III elements that give dealers and, presumably, regional dealer groups access to customizable TV, print, radio, banners and social media assets.